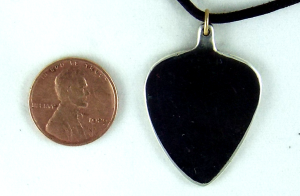 Below are two .999+ silver guitar picks I made. 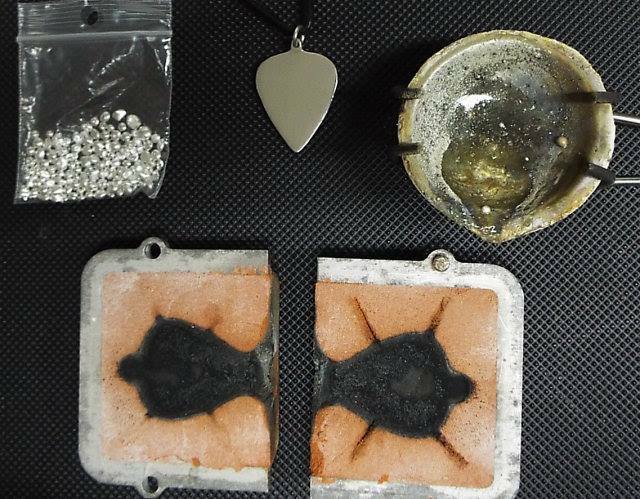 Each mold was formed from a guitar pick I acquired at the Rock & Roll Hall Of Fame in Cleveland. My Mom and I went there when I was visiting her in Youngstown. Notice the two pieces next to the pick on the 2mm leather cord in the top picture. 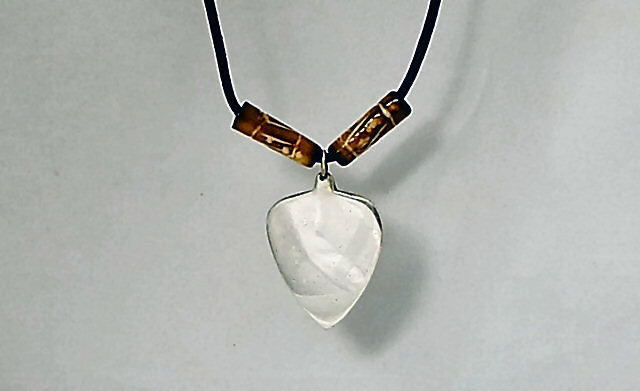 I made those from “jewelers grade” bone pieces. I cut, carved, burned, polished then applied four coats of clear lacquer to them. Below, notice the two piece mold. This was the only way “I” could figure out how form a thin (appx. 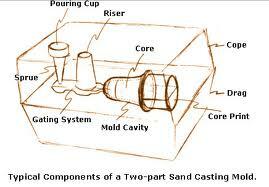 .070″) item via sand casting. The mold housing is made from one side of an aluminum housing that I cut in two and arranged into a two piece box that has “guide pins” for alignment. I must repeatedly hammer and pack the casting sand into this thing (while in a vise) so, it had to be pretty strong. I worked with what I had but, the aluminum box is heat and corrosion resistant as well. This contraption has held strong for over 100 castings so far. I plan to put ends on it with a small cutout for the cup & sprue. Here is a horizontally configured mold with proper terminology. 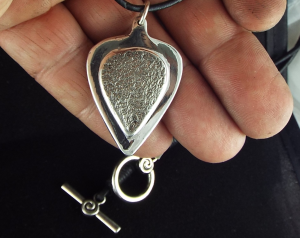 It is clamped in a vice so the guitar pick is positioned vertically. I then pour molten silver straight down into the mold. The vent lines you see allow the gases to expand. Without these vents the silver will not fill the mold and there is a mess. After coming from the mold, there is a lot of grinding, shaping, drilling and polishing. I eventually polish to a mirror finish and protect with Renaissance. 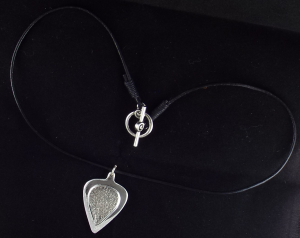 There are a lot of materials used to make just one silver guitar pick. Not to mention time. “My” basic materials required but, the more detailed the piece, the more tools and disposables used. Below is the first one I ever made. I wear it almost every day. Okay everyone! I just imagined this last night and made one today (11/25/2014). Took me 10 hours. This piece represents perspective pertaining to beauty that resides everywhere. The “material” may be the same but, it’s all about the beholders immediate eye. Some may like the raw look of the natural silver. Some may respect the refined and polished socially acceptable. Some may admire the chaotic transition between the two and where they sometimes escape. Just as you, I and everyone retain these characteristics and present ourselves within our own perspective. I made a .999 silver pick that is a whopping 3/16″ thick. I cast it with rough sand. I then filed the edges down around the center with a very small file for several hours. During the polishing process, I left small tooling marks too, very faint and remaining because this piece is just that. The center I left raw retaining the aesthetic detail of molten silver right from a crucible into traditional sand cast. I wanted the contrast between the refined versus reality go well but, I was not sure until I was a couple hours into removing the edges. I will put more items here as they develop. Feel free to comment. Inspiration and criticism is welcome!